OAKLAND, Calif., April 12, 2018	(Newswire.com) - Dictum Health – innovators in telehealth's Virtual Exam Room (VER) technology that supports patients across the continuum of care – announced today that North Huntingdon EMS/Rescue (NHEMS/R) has added the Dictum Health telehealth solution to their Community Paramedicine/Mobile Integrated Health (CP/MIH) program. 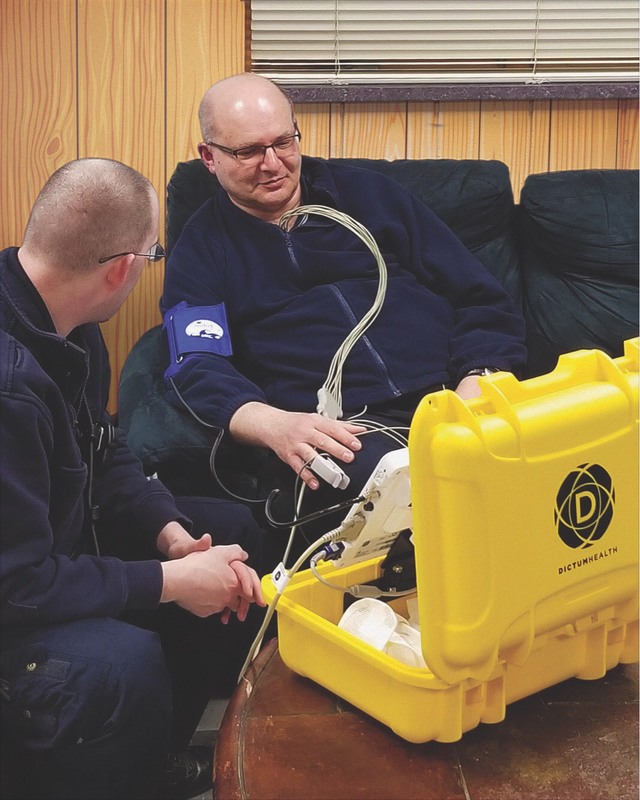 Through the expansion of this program, NHEMS/R expects to collect more complete, timely data on frequent users of emergency medical services using Dictum Health's VER-MEDIC telehealth system and to reduce avoidable hospital visits. The VER-MEDIC will be used for scheduled health checks on known high-risk, frequent-user patients. "This unit allows our Community Paramedicine program staff to quickly and efficiently gather vital patient information and to share this information with our healthcare partners in real time," said Shane Spielvogle, RN-BSN, PHRN and executive director of North Huntingdon EMS/Rescue. "The video conference and digital stethoscope make remote physician consults much more meaningful." The VER-MEDIC telehealth case is mobile, lightweight and ruggedized, which NH EMS/Rescue can use in patients' homes as an extension of the paramedic trucks. Technicians conduct patient exams with VER-MEDIC that include complete vital signs, cardiopulmonary data and, if needed, the ability to virtually connect with a remote physician or specialist for a full video and diagnostic consultation. "Our VER capability is advancing healthcare delivery outside the hospital with the goal of improving patient outcomes for those who need it most," said Elizabeth Keate, vice president of product management at Dictum Health. "Rural and remote areas have become hospital deserts, pushing EMS to the center of healthcare delivery, so by opening access to a remote specialist using telehealth, we can reduce unnecessary transport and prioritize at-risk patients." The telehealth component of this program is part of a project funded by a local payor-affiliated organization in Pittsburgh to improve care response to high-risk patients in the community and to reduce avoidable hospital visits. The data for patients and system usage are being collected and evaluated for further program evaluation to assess more widespread adoption in other CP/MIH programs in the region. North Huntingdon EMS/Rescue (NHEMS/R) provides emergency medical and rescue services to North Huntingdon Township, Pennsylvania. NHEMS/R’s focus is on providing safe, efficient, emergency and non-emergency care to the residents and visitors to our community. For more information, visit www.nhems-rescue.org. Dictum Health’s innovation expands healthcare access to the most at-risk patients with the same clinical accuracy as an in-hospital exam anytime, anywhere. The Virtual Exam Room (VER) product line features the FDA 510K Class 2 cleared IDM100 Medical Tablet with Care Central HIPAA-compliant cloud services that connect clinicians with patients through a virtual exam with simultaneous viewing of medical data and images. Indicated for clinical and patient home use, our telehealth system supports all patient populations from neonate to adult across the continuum of care from incident to hospital, to rehab, to home recovery. For more information, visit www.dictumhealth.com.